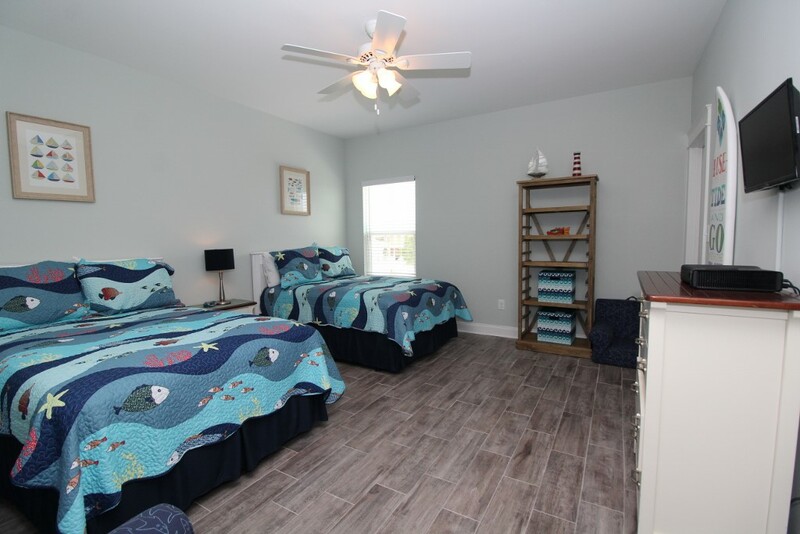 Treat your family to a charming beach retreat and discover the beauty and splendor of the Alabama Gulf Coast when you stay in our lovely 5 bedroom private home at Parks Edge! 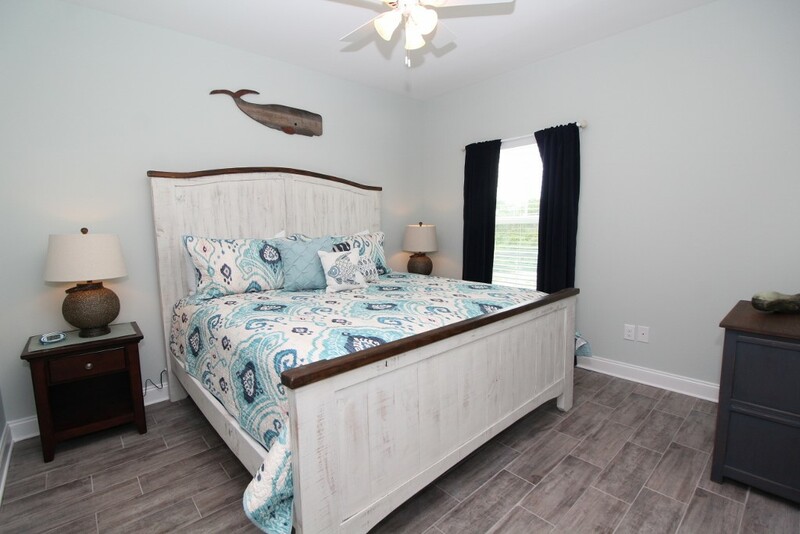 Turquoise Tailwinds is a brand new seaside cottage that offers 5 spacious bedrooms including a bunk room, 5 and a half modern baths and a fabulous location situated directly in the heart of Orange Beach, AL. With close access to the turquoise waters and white quartz sand beaches of the Gulf of Mexico, plus all the best shops, restaurants and direct access to the scenic Gulf State Park, you will have everything needed to experience the vacation of a lifetime! 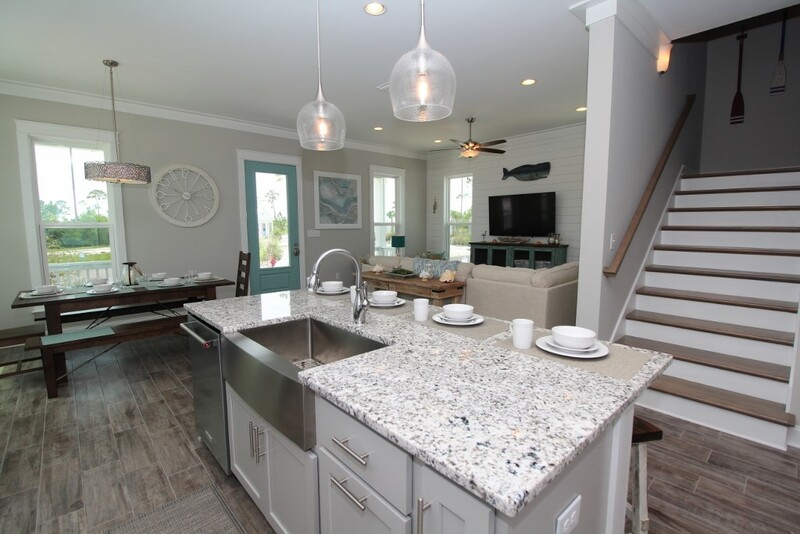 The open concept of the main floor is cozy and inviting, with chic coastal décor and new designer furnishings. Lounge on the plush sectional, or one of two cushioned side chairs in the living room and watch the game or binge your favorite shows via the wall mounted smart HDTV. Access all of your favorite streaming service such as Netflix, Hulu & Amazon Prime! (Personal login required.) The couch can also be converted to a queen sleeper sofa, affording additional sleeping space! The dining area offers a beautiful rustic farm-style table with bench seating that can accommodate up to a party of 10! 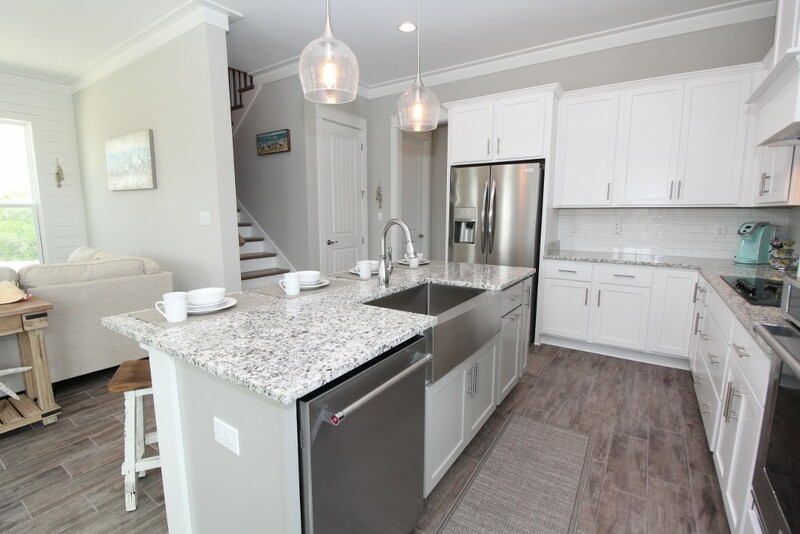 The kitchen features stainless steel appliances, marble countertops, and a large island perfect for entertaining, with additional seating for 4. 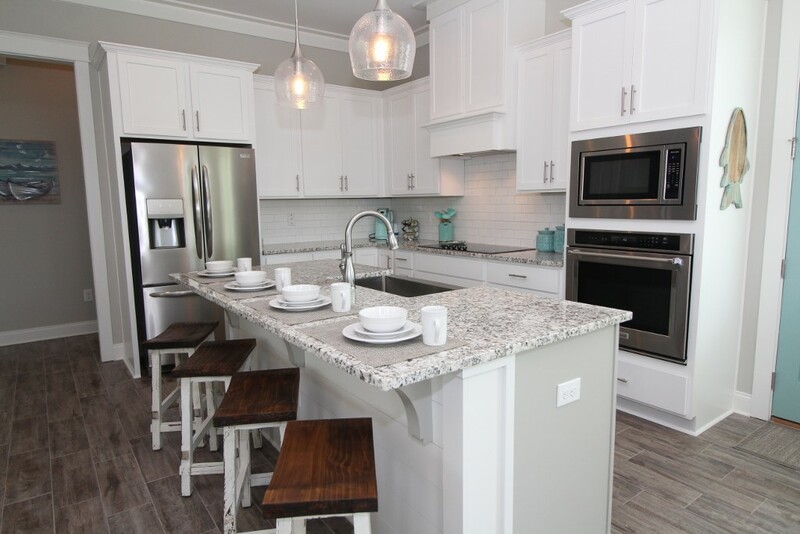 The cabinets and drawers are fully stocked with all the cookware, dishes, glasses, cooking utensils and small appliances necessary to prepare a gourmet meal! There is a 12-cup standard coffee maker, plus a chic aqua Keurig for you K-cup lovers! The master suite includes a plush king sized bed and an ensuite bathroom, featuring an expansive walk-in shower, double sinks and a whirlpool tub. The second and third bedrooms also include king beds. The fourth bedroom has two doubles and even an Xbox, which the teens will love! 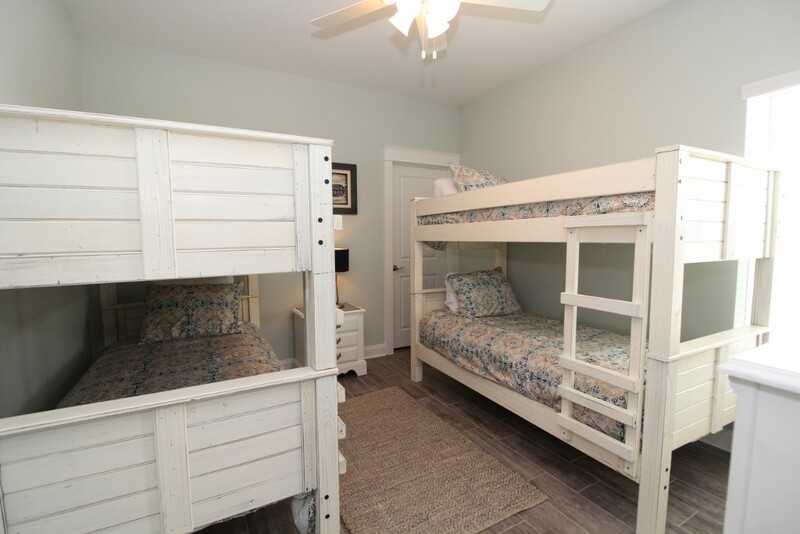 The 5th bedroom, aka the bunk room is perfect for the kiddos, including 2 sets of twin bunk beds, a wall mounted flat screen TV and a built-in DVD player! 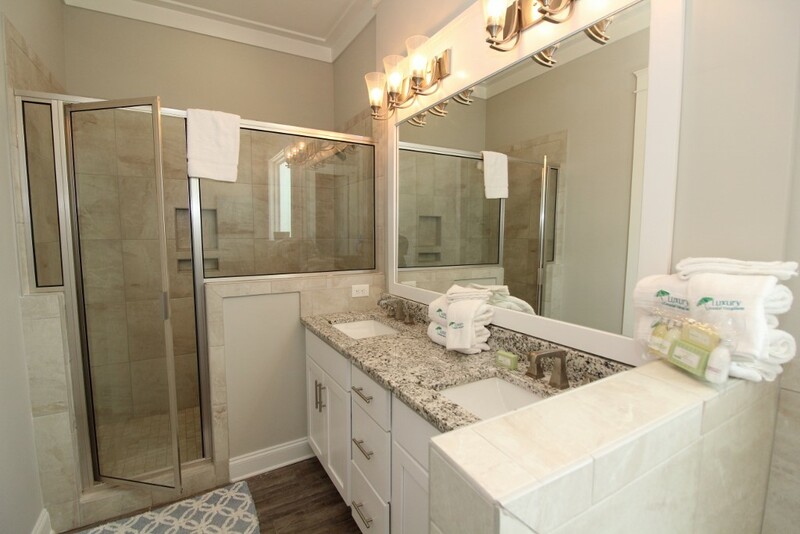 Additional features in this non-smoking home include high speed WiFi throughout, spacious laundry room with a brand new washer/dryer and utility sink, and there is even an outdoor shower! This home offers the best of both worlds. With private deeded beach access only 500 yards away from the property, a community pool and a charming bridge connecting directly to the Gulf State Park, including over 25 miles of the Hugh S. Branyon Backcountry Trails for walking, running or biking, Turquoise Tailwinds at Parks Edge is the perfect vacation destination for families, adventurers or for those simply looking to escape from the hustle and bustle of daily life and indulge in the splendor and beauty of the Gulf Coast. The owner has spared no expense to make this vacation home THE place to stay on the Gulf Coast! They will be adding an additional storage area in the back of the property that houses rental bikes for all ages! The bikes are available while the owner is building the storage area. For a flat fee of $100, guests have access to the bikes for their entire stay! There is also a pack and play with mattress stored in the closet for easy access. Inquire today for more details! * Parks Edge Turquoise Tailwinds is located in a quiet, family friendly area in Orange Beach, Alabama. The entire city of Orange Beach has a firm noise ordinance after 9pm on weekdays and 10pm on weekends. The Orange Beach police do patrol the area and we have full time neighbors that will notify the rental management company of any major disturbances. We want you to enjoy your vacation but also ask that you be respectful of other neighbors. My dad surprised our entire family with this beach vacation! The house was beautiful and had everything we needed. 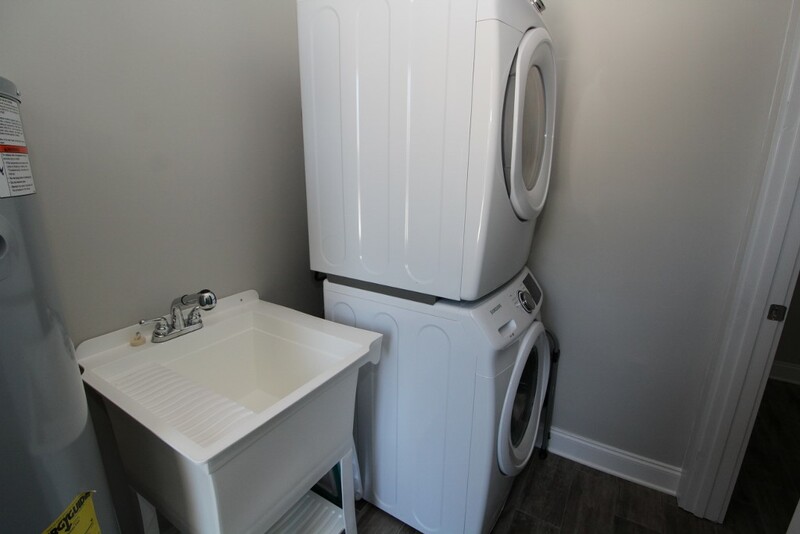 The beds were comfortable, house was clean when we arrived and having a washer and dryer was a big plus. There were 13 of us and we had plenty of room throughout the house. The only downfall was when the construction crew cut the cable and internet lines leaving us with nothing for 2 days, but that allowed more family game time while it rained. The pool is literally across the street and majority of the time we were the only ones there. The restaurants around here are really good. We also visited the Naval Avation Museum which was fun for the kids and it was also free. We got to see the Blue Angel's practice which was awesome. We will definitely stay here again. Thank you! This house was clean and well furnished. I loved that we were so close to the Gulf Shores State Park and the non-public beach. I biked at the state park and walked through the park to the beach. It was too cold to use the community pool, but it was very close to our house. It was a great place to vacation and I am looking forward to going back! We had a wonderful stay at the Turquoise Tailwinds. The house still smells new and we had so many amenities....linens, towels, free wi-fi, tvs in every room, bathrooms with each bedroom, a fully equipped kitchen, washer/dryer and two nice porches to sit on outside. The Gulf Shore State Park is about 100 yards from the house with a walking bridge that goes right to the walking/biking trails (25 miles of trails). We hiked and biked at the trails which are paved and well kept. It was a little chilly during our stay but we did go to the beach which is a very short walk. It was well kept and the sand was so white! There are many things to do and see in the Orange Beach area. The house is located in the back of the development, so there was not traffic and limited activity. We loved the serenity of it all and can't wait to go back again. I want to start by saying my kids said this was the best vacation ever (kids range from 5-14 yrs old). As a family of 7 we stayed there with my sisters family and there was still plenty of room for more people. This brand new house is gorgeous........my 5 year old just kept saying how she loved our new house. LOL. There is a community pool literally in front of the house which we took advantage of almost every day and had it all to ourselves. They have a great selection of bikes for all of us to use... My son and I enjoyed riding the bike into state park trails, were able to enjoy some nice pictures of beautiful scenery and rode bikes straight to the beach from the trails. The kitchen is really nice with all new appliances and had everything I needed to cook for our big family, all it took was a trip to the grocery store. The white sandy beaches are only 2 minutes away walking, with private section that was super clean and not crowded at all! If your looking for a place to be able to relax or be adventurous, your family will love this luxury home! We are already planning our next vacation to Parks Edge Turquoise Tailwinds. Perfect getaway! Brand new home with lots of space for multiple families. Extensive bike trails and beach access just minutes from the house. Beautiful home away from home! We couldn't have asked for a better vacation rental. The house was sparkling clean with beautifully decorated rooms and a fully equipped kitchen. 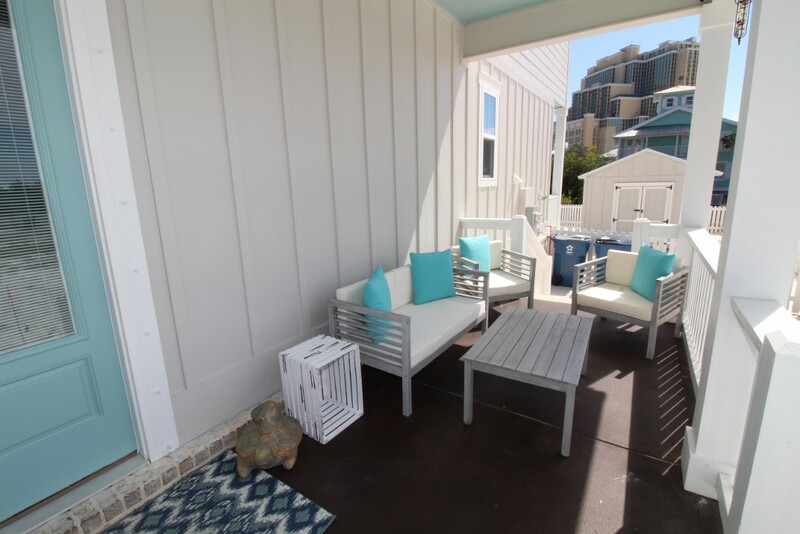 It was also in the perfect quiet location, just a few minutes walk to the beach. We enjoyed our stay so much we would come back and stay there again!!! Beautiful house, wonderful location with private pool & beach 2 minutes walk. Lovely outside veranda for morning coffee & lunch. Some great restaurants close by - but large bar b que out back for those that want to cook and plenty of bikes to cycle along the purpose built trail around the lake. All in all a great vacation.